Everything is interconnected. The Sun's cooling down, Earth's magnetic field weakening. The Earth's Magnetic Poles are shifting. Tectonic Plates appear to be moving from West To East. Earthquake swarms are occurring in new places. Larger Earthquakes occur more often. Volcanoes are erupting with greater frequency & New Fault Lines are being discovered. All these things are occurring at the SAME Time .... and .... that time is N O W! The West Coast "Big One"
This is sort of square one. People started to take notice when mainstream media sources began to report on the fact that airline runways were being repainted because the earth's magnetic poles had shifted so much; the old ones were no longer usable. Then came the "projected" estimates of where the poles were going and how fast they were moving. All turned out to be wrong.... or at least "off the mark". Next came the assurances that no "disasters" would be accompanying the coming poleshift that "was a long way off" and would happen "slowly over a long period of time". That also is proving to be less likely to be accurate. TAMPA - Scientists say the magnetic north pole is moving toward Russia and the fallout has reached -- of all places -- Tampa International Airport. The pilots use a compass to find the right runway to land on. Guess what? Those compasses now say magnetic north is 10� East of what WAS True Magnetic North. The airport has closed its primary runway until Jan. 13th, 2011; in order to repaint the numeric designators at each end... and change taxiway signage to account for the shift in location of the Earth's magnetic north pole. So, now we have "4" magnetic poles as the "shift" is currently underway. 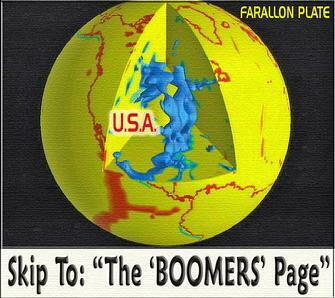 It is probable to happen within the next 80 years (latest opinions) and ... happen quickly. How Quickly? Believe it or not... some fossil records show it all went down in one week's time in some cases! And, guess what? Some of those shifts were NOT so gentle. Swarm satellite (ESA) measurements made from January to June 2014 show a dramatic decline in Earth's magnetic field over North and South America with a strengthening of the Earth's magnetic field over the southern Indian Ocean. 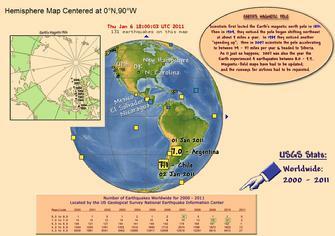 James Smith, owner of fossil fuel research and recovery corporation, southeastern United States, who asked for anonymity: “The Lamont-Doherty Earth Observatory (Columbia University) published an article February 5, 2015, and data showed that strikingly regular patterns in seafloor volcano cycle activity relate historically to Earth’s impending magnetic pole flip. (Linda) - SO, THIS IS REINFORCING THE IDEA THAT HAS BEEN PRESENTED BY SOME GEOPHYSICISTS RECENTLY THAT WE MIGHT BE IN THE CENTURY IN WHICH THE MAGNETIC FIELDS OF THIS PLANET WILL CHANGE — THE NORTH WILL BE IN THE ANTARCTIC AND THE SOUTH WILL BE IN THE ARCTIC. Part 2: Are Inner Core Changes Causing Mysterious Booms and Magnetic Field Changes Leading To A Magnetic Pole Flip? NOTE: An Earth magnetic pole reversal can occur in as little as a 2-4 week period. With a magnetic pole reversal is also likely to occur a lot of climate change. The earth's rotational axis may likely begin to shift as well; giving a whole new meaning to the phrase "Interesting Times". Where go the magnetic poles go the polar regions. Where go the polar regions also seem to go the rotational axis. (Remember those flash frozen wooly mammoths with buttercups still in their mouths?). Where go the polar regions, also will go the Jet Stream. If its acting a bit "wonky" ... could the magnetic pole shift (acknowledged to already be underway) be the reason? For the first time in history The sun rose in Ilulissat, Greenland, two days early (at around 1:00 PM) on Tuesday (11 Jan 2011) ... 48 hours ahead of the usual date of January 13th. The fishing town of Ilulissat is Greenland's most westerly habitation. Scientists scoff at the idea of the cause being in any way Astronomical and say its just there's less snow on the ground, so the Sun is seen sooner. "The funny thing is that the Sun in Ilulissat factually rises from behind mountains without ice"
REGIONS BECOMING COOLER: are around 30° NORTH & 30° SOUTH of the equator. BOTH SPOTS ARE around 12,000 miles from each other ... JUST AS OUR CURRENT POLAR REGIONS ARE RIGHT NOW. The last "stable" magnetic reversal occurred 780,000 years ago, BUT; there have also been times when the earth's magnetic field moved south and then moved back north during a (perhaps) 500 year period. There was the Gothenburg magnetic reversal / meandering of about 12,000 years ago. During this reversal or magnetic meandering; some 40 percent of all of the larger mammals in North America (the mammoths, mastodons, sabre-toothed tigers & The Great Dire Wolf) became extinct. That's turns out to be when the "Carolina Bays" were blasted into the ground and carbon rained from the sky. In addition ... at that time... soil radiation levels measured up to 2,000 times higher than normal. During the Mono Lake magnetic reversal 23,000 years ago; the European forest elephant went extinct, mammoths became extinct and a catastrophic ice age began. The Lake Mungo magnetic reversal occurred 33,500 years ago... that's when the Neanderthals became extinct. During the Blake magnetic reversal of 115,000 years ago during the Eemian Period (Sangamonian in the U.S.). The Earth was warmer than it is today ... but in between 20 - 100 years an ice age began. NOTE: At the same time that science says the last magnetic reversal occurred 780,000 years ago; we are also told that �geomagnetic field reversals� occur roughly every 200,000 years, normally taking about 4,000 years to make the change. Yet evidence is coming to light that "quick reversals" also have occurred at the rate of about one degree per week.... another example showed 6 degrees per day! The completed movement appeared to total 53�. The Farallon Plate was an ancient oceanic plate, which began subducting under the west coast of the North American Plate— then located in modern Utah. At one time, most of the western United States was underwater; an ancient seabed covered in underwater volcanoes. 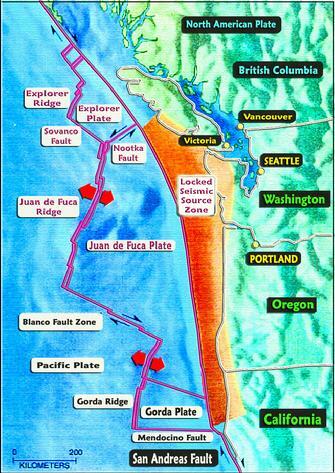 Today, the remains of the Farallon Plate are known as:  - the Juan de Fuca, Explorer, and Gorda Plates; which are subducting under the northern part of the North American Plate;  - the Cocos Plate subducting under Central America; &  - the Nazca Plate subducting under the South American Plate. It is thought that much of the Farallon Plate initially went under North America (particularly under the western United States and southwest Canada) at a very shallow angle, creating much of the mountainous terrain in the area (particularly the southern Rocky Mountains). Now ... a large fragment of the subducted plate is believed to be located withn the Earth's mantle under eastern North America. 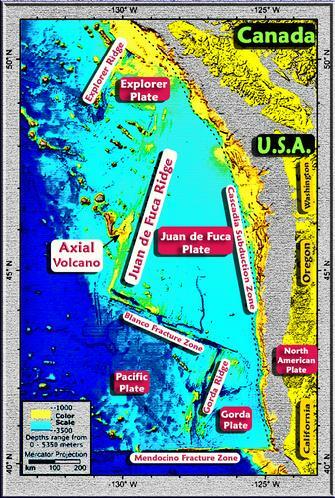 Thus one part of the Farallon Plate is oozing on the west coast ... another part on the east coast ... and yet a third part ... throughout the middle of the United States and ... Central America. What do we mean by "oozing"? That it is not solid ... but exists in a viscous, magma, or molten state. Also in 2015, the Axial Seamount Volcano started going off. Speculation was rampant about the implications. Then, in August of 2015 ... A Man & His dogs go to Yellowstone ... jump into their favorite swimming hole and "get cooked" alive. SOMETHING had to have heated that water to above boiling! SAN JOSE, California (AP) -- Small earthquakes shaking Oklahoma and southern Kansas daily and linked to energy drilling are dramatically increasing the chance of bigger and dangerous quakes, federal research indicates. This once stable region is now just as likely to see serious damaging and potentially harmful earthquakes as the highest risk places east of the Rockies such as New Madrid, Missouri, and Charleston, South Carolina, which had major quakes in the past two centuries. Until now, those quakes were mostly thought of as nuisances and not really threats. But Ellsworth's continuing study, which is not yet published, showed the mere increase In the number of tiny temblors raises the risk of earthquakes that scientists consider major hazards. That's generally above a magnitude 5 with older buildings and a magnitude 6 for modern ones, Ellsworth said. "The more small earthquakes we have it just simply increases the odds we're going to have a more damaging event," Ellsworth said. "Oklahoma is now more seismically active than California" - earthquakes triggered by hydraulic fracturing can exceed �what the natural hazard was in the first place� and pose risks to infrastructure only built to withstand natural earthquake hazards. TO FRACK OR NOT TO FRACK ...? “Expert Gail Atkinson warns industry-induced quakes can cause more damage than natural ones. One of Canada’s foremost experts on earthquake hazards recently told an audience of Calgary engineers that earthquakes triggered by hydraulic fracturing can exceed “what the natural hazard was in the first place” and pose risks to infrastructure only built to withstand natural earthquake hazards. As well, earthquakes induced by fracking can produce more damaging ground motion at lower magnitudes than natural quakes due to their shallowness, said Gail Atkinson, the NSERC/TransAlta/Nanometrics Industrial Research Chair in Hazards from Induced Seismicity at Ontario’s Western University. Natural earthquakes have an average depth of 10 kilometres, whereas industry-made tremors are much shallower and closer to the ground surface where people can feel them more strongly. Natural earthquakes typically cause structural damage in buildings at a magnitude of 5.0, Atkinson said. But earthquakes triggered by fracking could possibly cause damaging ground motions at magnitudes as low as 3.5 to 4.0, due to their shallowness. Hydraulic fracturing intentionally creates hundreds of microseismic events by cracking deep or shallow hydrocarbon formations with high-fluid injections of water, sand and chemicals. But the technology, which can’t yet model where all the fractures will go, has activated faults and slips in Ohio, Oklahoma, England, British Columbia and Alberta, creating headline-making earthquakes in the last three years." 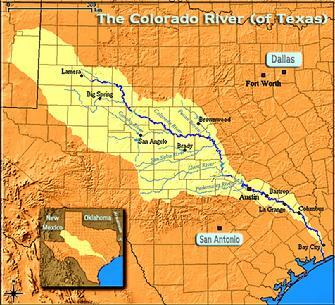 THIS Colorado River is in Texas. How might it be affected by fracking in the future? Should fracking earthquakes result in deeper quakes under the Balcones faultline ... what could be next? To add to all this ... many now believe there is a network of fault lines connecting the activity in Oklahoma and the New Madrid. For the Longest Time, scientists would say things like: Earthquakes can't be predicted ... no one earthquake is connected to another ... well; again ... not so. Not only does it appear the volcanoes may share some sort of deep network of magma tubes or tunnels ... or even be connected to some of the same magma chambers from deep in the mantle, but; it could also be that earth's fault lines are ALSO connected in ways scientists are just beginning to perceive. Some believe we could be sitting on one big set of domino's ... all standing one end ... just waiting for the right "tipping" trigger to set them all off. DALLAS (CBSDFW.COM/AP) – Eleven earthquakes, three of them greater than a 3.0 in magnitude, rocked North Texas through Tuesday and Wednesday, knocking items off of walls, causing cracks to appear in ceilings and generally rattling nerves across the region. “The last one really shook,” said CBS 11 News anchor and reporter Ken Molestina, who felt the the earth moving in the White Rock Lake area of Dallas. Other people reported feeling the temblors in the uptown area of Dallas and even as far away as Bedford and Mesquite. The latest quake was reported just before 10:00 a.m. on Wednesday, measured in at a 2.7 magnitude, and was centered near the convergence of Highway 114, Loop 12 and the Airport Freeway, near the old Texas Stadium site in Irving. Lately (as of Nov 2015) there have increasing reports of Quake Swarms. Some in California, some in Oklahoma, some even in Hawaii. Before that, Texas saw wnormous swarms outside of Dallas. In the past, that would be a good sign in that it would indicate the releasing of seismic pressure. But now, it may be that Fracking and other factors have set in motion some sort of Tectonic movement which is CREATING pressure rather than relieving it. Yep ... "scientists" have once again been adding 2+2 and getting Five. The Last Time it Happened? THE "411" ON THE "9.0"
—losing, within minutes, all the elevation and compression it has gained over centuries. Some of that shift will take place beneath the ocean, displacing a colossal quantity of seawater. The water will surge upward into a huge hill, then promptly collapse. One side will rush west, toward Japan. The other side will rush east, in a seven-hundred-mile liquid wall that will reach the Northwest coast, on average, fifteen minutes after the earthquake begins. WHAT ABOUT THE LAST TIME? The ghost forest, is a grove of western red cedars on the banks of the Copalis River, near the Washington coast. These cedars are spread out across a low salt marsh on a wide northern bend in the river, long dead, but some are still standing. What killed the trees in the ghost forest was saltwater. Samples of the cedars indicated they had died simultaneously: in tree after tree, the final rings dated to the summer of 1699. Since trees do not grow in the winter, it was concluded that sometime between August of 1699 and May of 1700 an earthquake had caused the land to drop or the seas to rise ... and killed the cedars. JAPAN : On the eighth day of the twelfth month of the twelfth year of the Genroku era, a six-hundred-mile-long wave struck the coast, levelling homes, breaching a castle moat, and causing an accident at sea. The Japanese understood that tsunamis were the result of earthquakes, yet no one felt the ground shake before the Genroku event. The wave had no discernible origin. At approximately nine o’ clock at night on January 26, 1700, a magnitude-9.0 earthquake had struck the Pacific Northwest, causing sudden land subsidence, drowning coastal forests, and, out in the ocean, lifting up a wave half the length of a continent. It had taken roughly fifteen minutes for the Eastern half of that wave to strike the Northwest coast. It took ten hours for the other half to cross the ocean. It reached Japan on January 27, 1700: by the local Japanese calendar, this occurred on the eighth day of the twelfth month of the twelfth year of Genroku. HOW OFTEN? (Does this happen) - We now know that the Pacific Northwest has experienced forty-one subduction-zone earthquakes in the past ten thousand years. If you divide ten thousand by forty-one, you get two hundred and forty-three, which is Cascadia’s recurrence interval: the average amount of time that elapses between earthquakes. That timespan is dangerous both because it is too long—long enough for us to unwittingly build an entire civilization on top of our continent’s worst fault line—and because it is not long enough. Counting from the earthquake of 1700, we are now three hundred and fifteen years into a two-hundred-and-forty-three-year cycle. Recurrence intervals are averages, and averages are tricky: ten is the average of nine and eleven, but also of eighteen and two. A grown man is knocked over by ankle-deep water moving at 6.7 miles an hour. The tsunami will be moving more than twice that fast when it arrives. Its height will vary with the contours of the coast, from twenty feet to more than a hundred feet. It will not look like a Hokusai-style wave, rising up from the surface of the sea and breaking from above. It will look like the whole ocean, elevated, overtaking land. Nor will it be made only of water—not once it reaches the shore. It will be a five-story deluge of pickup trucks and doorframes and cinder blocks and fishing boats and utility poles and everything else that once constituted the coastal towns of the Pacific Northwest. Six months without electricity, one to three years without drinking water and sewage systems, and three or more years without hospitals. 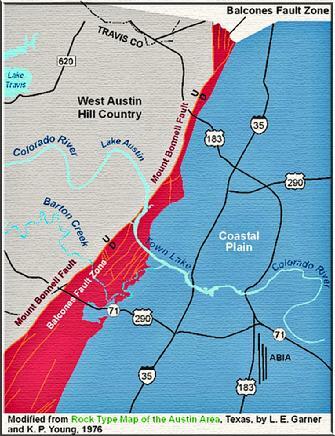 Those estimates do not apply to the tsunami-inundation zone, which will remain all but uninhabitable for years. 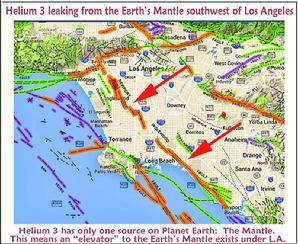 It couldn't get anymore "SCI-FI": Everyone knows about the San Andreas Fault in California. BUT; there is a lesser known Fault which could be far more dangerous.... The Newport-Inglewood Fault. It runs from Costa Mesa to Culver City; then thru Inglewood, Gardena, Compton, Signal Hill, Long Beach, Seal Beach, & Huntington Beach. Inglewood is leaking Helium 3 and kicking up metamorphic, blue schist rocks, & carbon dioxide from the Mantle of the Earth. Also weird ... the Inglewood faultline is thought to have formed when the Pacific Plate subducted under the North American Plate, 30 million years ago. But now that intersection (The San Andreas Fault) is 40 miles to the east of the Newport-Inglewood Fault. AND ... the Inglewood Fault is leaking greater quantities of material than the San Andreas. In other words ... once again ... they "haven't a clue". A Pipeline from L.A. to the Earth's Mantle! A new study claims to have cracked predicting solar cycles - and says that between 2020 and 2030 solar cycles will cancel each other out. In the First Instance: You've got 2 things that can go wrong. The First is the Maunder Minimum or "Mini-Ice Ages". What happens is enough places freeze so that people can't grow food and everybody starves, people can't keep livestock warm or fed, hte animals freeze; even the fish freeze... and lots of people die. Click Below on ICE-ICE-ICE for more info on that scenario. Second of All ... when the Sun cools down, it apparently also tend to shoot off some particularly powerful solar flares. 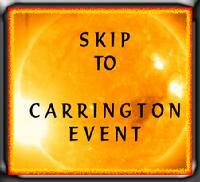 Just fewer of them and next to no sun spots .... but; a stronger CME or Solar Flare combined with the earth's weaker magnetosphere ... and you've got the potential for another Carrington Event (click link below for more info). Only NOW there's more electronics to get fried ... China makes all our Transformers and doesn't keep spares on hand ... the U.S. doesn't manufacture them anymore ... so the Electrical Grid goes down ... water can't be purified or pumped .... no gasoline gets pumped ... no nuclear reactors get cooled down ... there's no refrigeration for food or medicine ... hospitals can't operate ... and in general; "that's all she wrote" ... back to the Stone age We Go. It would only take a couple of Billion dollars to fortify the U.S.'s Electrical Grid against such events... but neither Congress, nor the President will take any action. As the Sun travels thru the Milky Way Galaxy it bobs up & down" like a float (or a cork) in water. And when our Sun hits the densest part of the Galaxy (its thicker in the middle) the Sun occasionally knocks (gravitationally speaking) some objects out of thier usual path and into ours ... into the Earth's path. Naturally they wreak havoc on the Earth. The last of these events is said to have occurred about 11 million years ago, roughly the same time as the Middle Miocene mass extinction. But according to geologist Professor Michael Rampino, it might be wrong to assume that we are living in a completely safe era, millions of years away from the next danger period. 'There is evidence that the comet activity has been high for the last one to two million years, and some comet orbits are perturbed, so we may be in a shower at the present time,' he said. Robert Schoch believes that 11,715 years ago, there was just such an extinction level event (an ELE); due to the Sun. The Age of Leo saw the "Great Deluge" and the sinking of Atlantis; Robert Schoch believes it was the result of the Sun's actions.